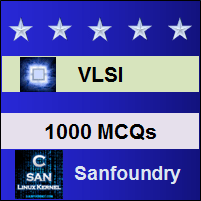 This set of VLSI Multiple Choice Questions & Answers (MCQs) focuses on “CMOS Logics”. Explanation: In Pseudo-nMOS logic, n transistor operates in saturation region and p transistor operates in resistive region. Explanation: The power dissipation in Pseudo-nMOS is reduced to about 60% compared to nMOS device. 3. Pseudo-nMOS has higher pull-up resistance than nMOS device. 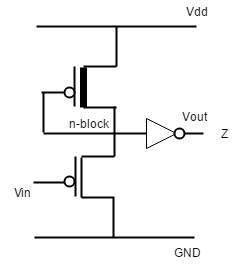 Explanation: Pseudo-nMOS has higher pull-up resistance than nMOS device and thus inverter pair delay is larger. Explanation: In dynamic CMOS logic, four phase clock is used in which actual signals are used to derive the clocks. Explanation: In clocked CMOS logic, the logic is evaluated only in the on period of the clock. And owing to the extra transistor in series, slower rise time and fall times are expected. Explanation: In clocked CMOS logic, rise time and fall time are slower because of more number of transistors in series. Explanation: In CMOS domino logic, single phase clock is used. Clock signals distributed on one wire is called as single or one phase clock. Explanation: CMOS domino logic is same as that of the dynamic CMOS logic with inverter at the output line. Explanation: CMOS domino logic structure occupies smaller area than conventional CMOS logic as only n-block is used. Explanation: CMOS domino logic has smaller parasitic capacitance and higher operating speed. Explanation: In CMOS domino logic, only non inverting structures are possible because of the presence of the inverting buffer. Explanation: The correct form of CMOS domino logic representation is as given in the answer.